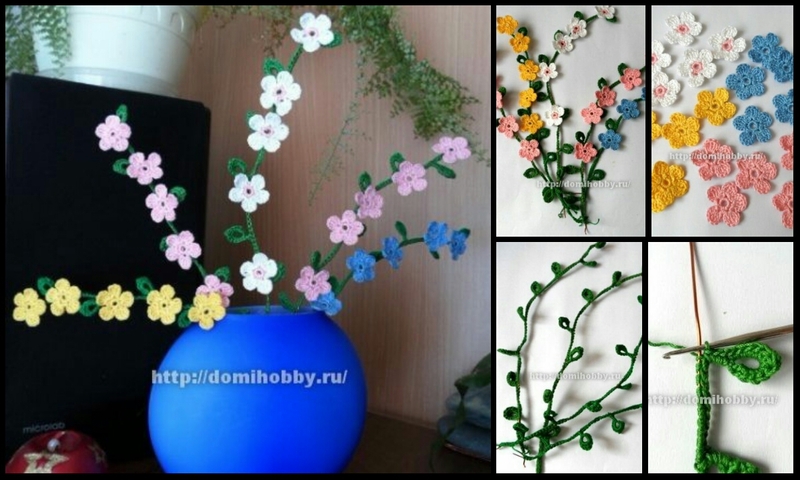 For knitting bouquet, you will need a thin copper wire, thread c / b "Iris" green, white, pink, blue and yellow, the hook number 1.5. Sprigs perform strapping wire. 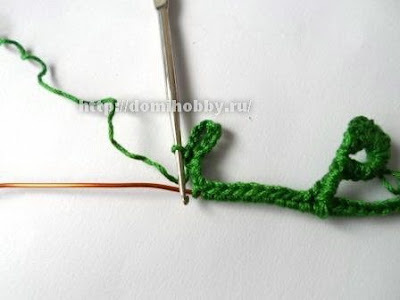 Fine wire cut length of 25 -30 cm and tied her green crochet thread associated branch on a wire will be good to keep the form that you will attach to it. 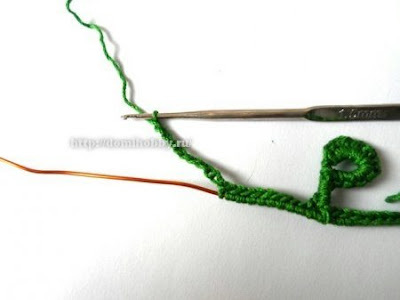 Knit the wire 10 columns without nakida, then knit leaf. 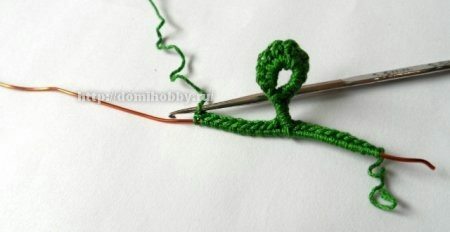 For leaf type chain of 10 stitches, close it in the ring, doing in the third loop of the connecting bar. Bind leaf formed from the ring, this type hook in the center ringlet knit and 3 tbsp. b / n, 1 Semiwall., 1 tbsp. s / n, 1 tbsp.c / 2N, 1 tbsp. s / n, 1 Semiwall., 3 tbsp. b / n. Then, on the leg tie leaf 3 tbsp. 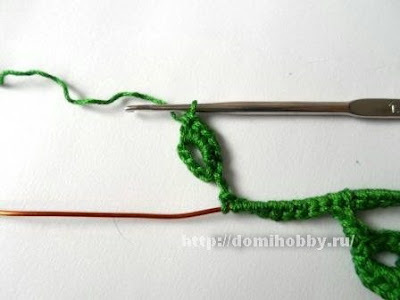 b / n and then knit on the next 10 st wire. b / n. * Repeat from * to * to end of the wire. Piping on the wire can twist that leaves are alternately arranged on different sides sprigs. 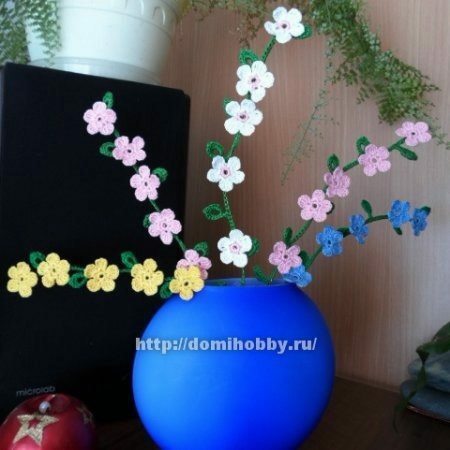 Related Groups twigs for a bouquet, start knitting flowers under the scheme. 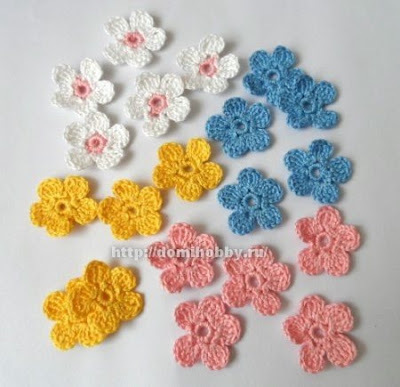 Flowers knit in an arbitrary amount of white thread, yellow, pink and blue. 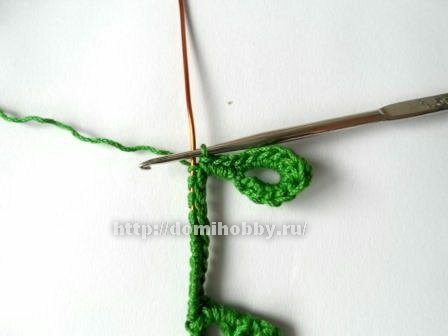 Description crochet flower: Enter the chain of 5 vozd.p. and close it in the ring connecting column. 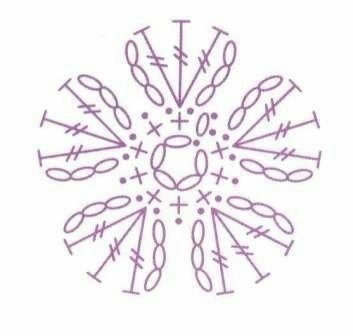 Knit 1st row starting with the first vozd.petli rise further by introducing the hook in the center of the ring, a circle knit 9 item b / n, complete a series of conn. Art. in lifting loop. 2nd row: * 3 vozd.p. 3 PT / 2N from the same point, 3 vozd.p. and soed.p. primary loop to secure the tab, then 2 soed.p. on a number of *, repeat from * to * 4 more times. 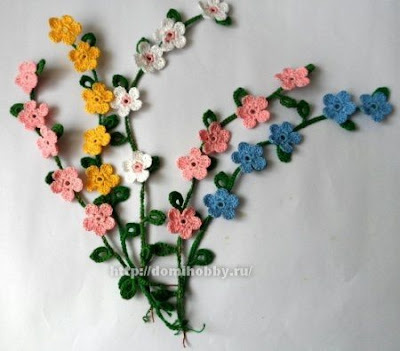 Related flower sew or glue a twig. 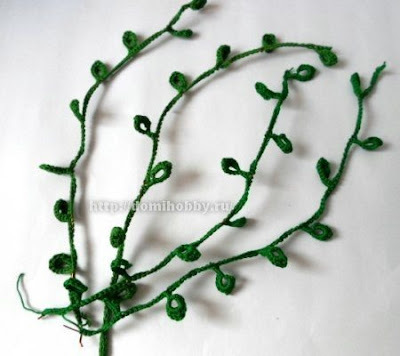 Finished knit branches gather in a bouquet and put in a vase. 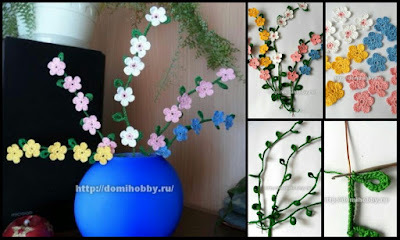 To twigs in a vase stood steadily, insert the tip of the lower wire in a piece of foam and attach it to the bottom of the vase.